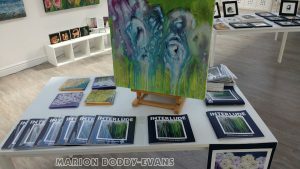 I’ve finally got photos of the paintings in my Interlude exhibition up as a photo gallery on my paintings website here. And if you scroll down this page a bit, there’s a short video of the exhibition. Thoughts and feedback through the comments section at the bottom of this blog or by email) would be appreciated as florals are new territory for me. A few notes: All these paintings are currently on show at Skyeworks Gallery; larger photos and/or details can be emailed on request. The gallery can ship paintings worldwide, either as is (flat) or taken off stretchers and rolled (cheaper posting, and a framer will be able to restretch it). The UK pound is at a 30-year low against the US dollar. 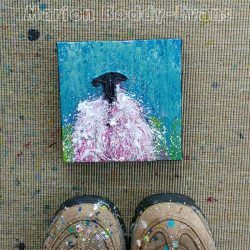 The exhibition catalogue, which has most (not all) of the paintings in it, is ?9.50 from Skyeworks (plus postage). Contact Skyeworks Gallery. I love your exhibition, Marion! Congratulations it is a beautiful presentation. Your flower paintings are so alive with personality, and your cat paintings are very typical of cats: both mischievous and secretive. I like the way your cats on canvas are ignoring you when you try to capture them! What fun! If I turned the canvases over, would I see their faces? so nice to see the variety of your work – all together makes for a most appealing presentation. It’s great to see the actual sizes. Love the way the little single flowers are framed. Beautiful work! What a lovely exhibition, and how nice to see a video tour of it. It is interesting to see the paintings hanging together after having seen them in progress. 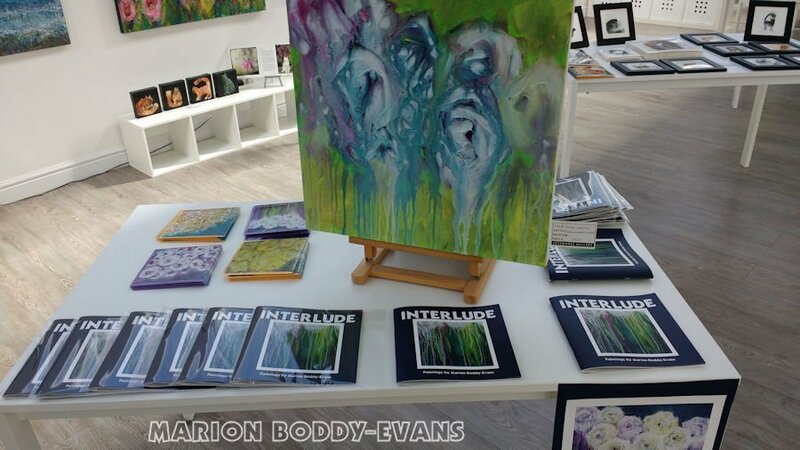 Congratulations on your Interlude Exhibition.